Samrdump is pre-installed on Backtrack 5 . You can find "samrdump" under SMB Analyis . 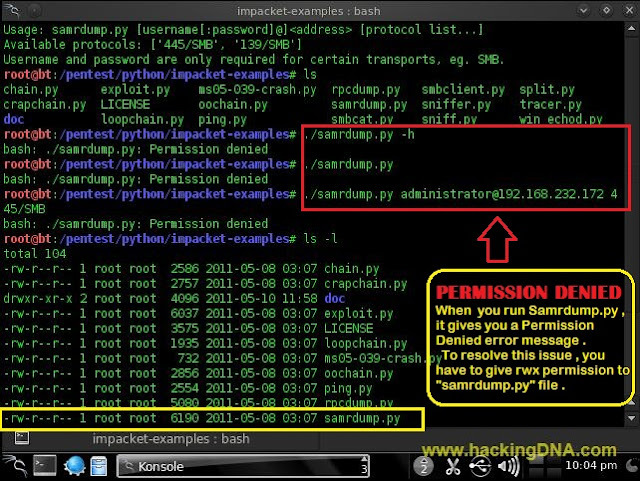 Samrdump is used to retrieved information about the target using SAM ( Security Account Manager). It lists out the all the domains , shares , useraccounts, and other information . If you get the permission denied error , then it means samrdump.py is not have a execute permission , so we have to manually give the permission using chmod command . The below image shows the Permission denied error . To apply permission , use chmod command as shown below in the image . Here we applied the read , write , execute permission to all user, group and others. In the Output , it shows al the user accounts with the uid. Also it shows the domain names . The only thing we should know is the username and password of target machine . Till then keep following www.hackingdna.com for more Backtrack 5 tutorials .